Be it a Tanchoi, a Jamevar or a knajeevaram, the more heavy the saree, the more sensational will be its effect on your look, provided you know how to look comfortable wearing it. Many a times we have found ourselves in situations where the dress or the saree we draped got the better of us, leaving us highly uncomfortable or on edge. Here are some of those terribly sloppy situations that arise when the saree is bit too heavy for you to ’manage’. 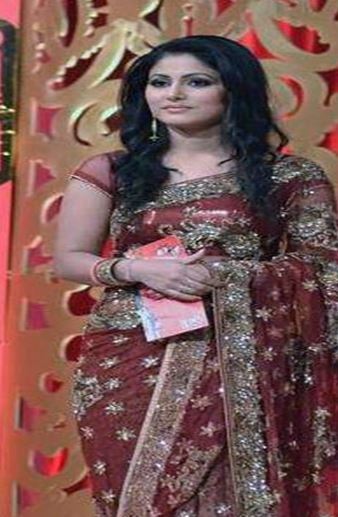 One finds it difficult to walk-Yes; the saree seems to be getting entangled or getting in between the legs. You are so conscious of your movement that each step seems like the last before the unthinkable that you have been dreading of –would happen! The pleats weighing down-this begins maybe an hour or so of moving around in a heavy saree-one feels that the weight of it has actually brought down several inches. The pallu getting lower, despite having pinned it. A certain amount of stiffness and lack of your natural self poise because of your being super conscious of your attire. The constant fear that you may have overdone the look-with too much jewelry and too much makeup! So is there some way of looking as great as these catalogue brides? Here are some simple but highly effective means to get that monkey of ‘Saree-wearing-fear’-off your back! Wear your heels first and then follow up with the petticoat. Adjust the level of the height-it should not be too low at the navel but just about covering it. And the petticoat must end right below the ankles and not at the ankles. The blouse should be worn next-ensure that the gap between the blouse and the top edge of the petticoat is not too wide-a bride must at all times be very elegant and demure, dressed to portray her most elegant self-ethereal and much above the rest. 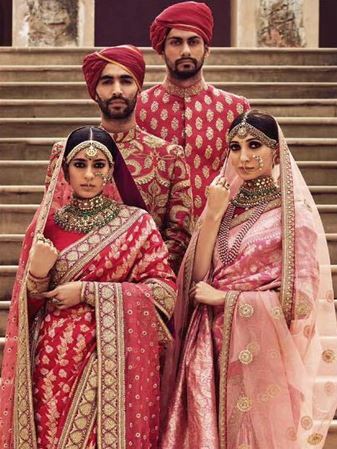 The pleating must be done after the pallu length has been decided-the length of the pallu will be decided on the style of saree you have decided to drape. Place a pin at the pallu and begin working the pleats. Pleats should be adequate in number-if the length is a little less to manage six to seven pleats-add some extra same coloured cloth to the inside of the saree. This usually is not needed if the saree has been purchased from a shop that is well known. 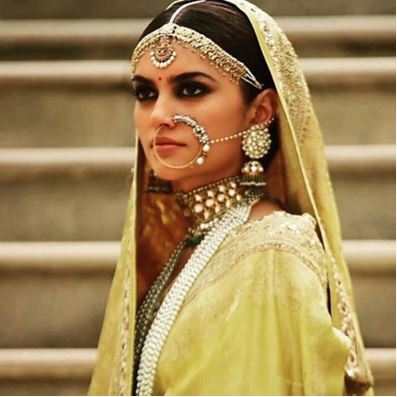 Remember that your jewelry choice matters as much as your clutch and your sandals for the day-it would of course be dependent on whether he saree is zari, kardana, pitta work, resham, gara, kundan, stone work, antique or zardozi- be it potli or clutch or the sandals, you must wear in accordance with the colour scheme. Never should diamond jewelry be worn if the saree has gold hues, and similarly if the work is gara in silver or zardozi in silver, choose kundan and diamond. 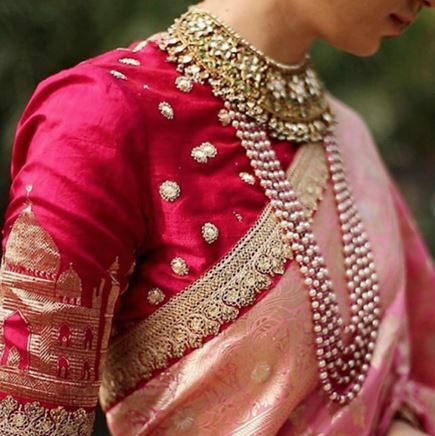 Avoid too much glitter-the quiet and sublime look of elegance is best created with dull antique gold and kundan and if your saree has hues of silver-go for kundan and pearls-it’s an exquisite sight. While draping the saree remember that it’s going to be a night long event is most cases-where post wedding rituals too do not allow you to change before good eight hours are done-so keep that in mind. Do run up to the washroom before the saree draping begins. Pinning up is the next most important aspect of wedding saree draping and three essential points of pinning locations are-pinning of the saree with the petticoat, which usually is the bottom most pleat ; pinning of the saree pleats to retain their form, and the pallu pin. 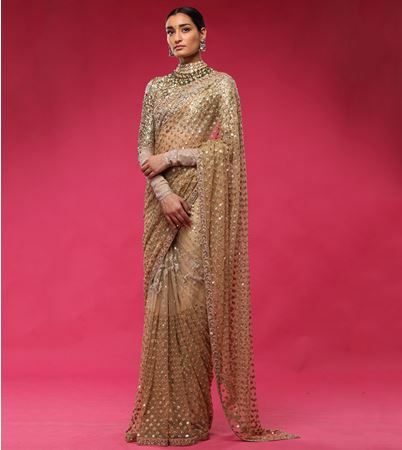 A bridal saree is perhaps your best option for a divine aura on your wedding day and little niggling worries that can be sorted with these easy to follow tips, should not mar your moment of absolute glory!